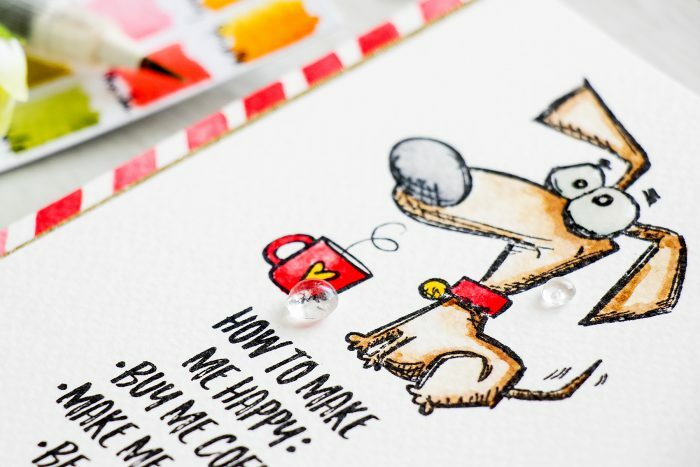 I have to say – I am really liking the Crazy Dogs stamp set from Tim Holtz that is included in Simon’s Masterpiece box. Even though we have cats, I do love dogs (and I hope we can get a dog in a few years). 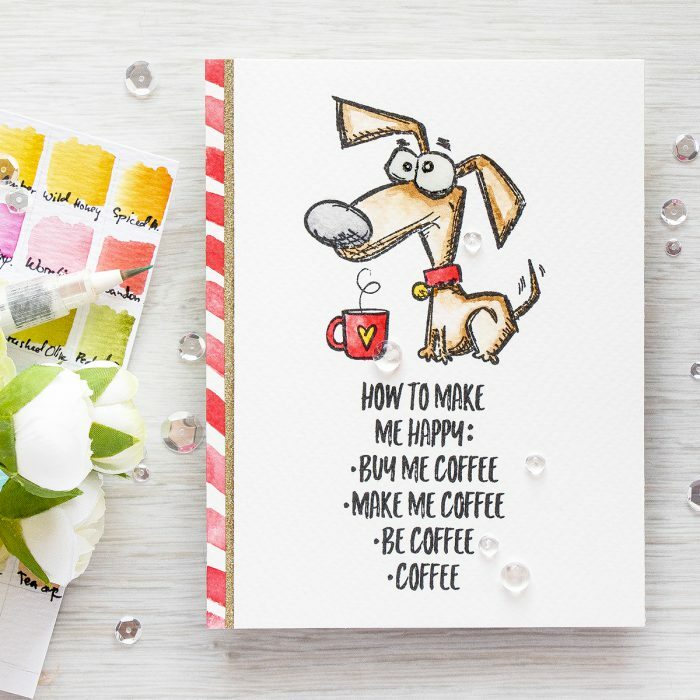 To create this card I picked the funniest dog in the set and stamped him in Versafine Onyx Black ink using my mini MISTI onto watercolor cardstock. 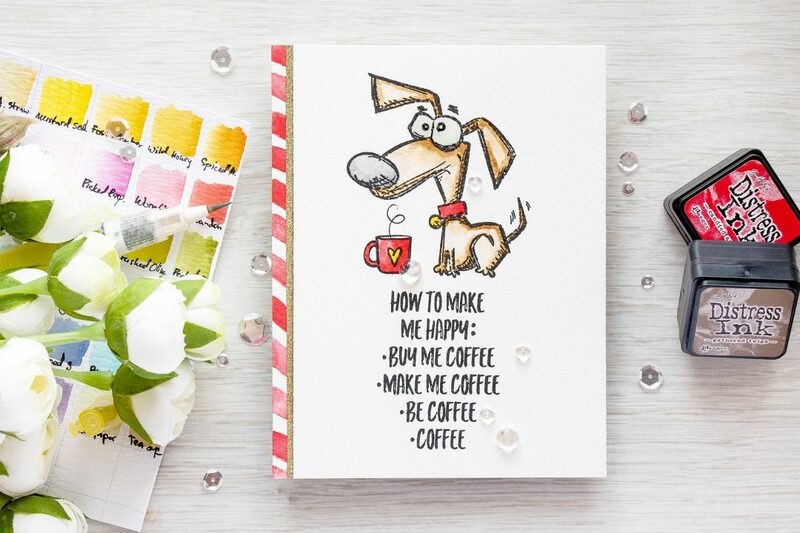 I also stamped a Coffee sentiment from the Choose Happy stamp set and a little coffee cup right under his nose. I recently got a few new colors of Distress inks, so I swatched all colors that I have and felt very inspired to use these to watercolor my images. I used Gathered Twigs (for the dog’s body), Festive Berries (for the collar and diagonal stripes), Tumbled Glass (for the eyes), Black Soot (for the nose) and Fossilized Amber (for the heart and bell). I added a a bit of Wink Of Stella glitter to the eyes and coated with a layer of glossy accents. The red diagonal stripe to the left was hand drawn, I wanted to include a piece of patterned paper like that but I didn’t have any that would work, so I just grabbed my 1/4 inch flat paint brush, Festive Berries distress ink and drew those diagonal lines. They aren’t perfect and the spacing is incorrect on many of these, but overall I really like how that piece turned out. 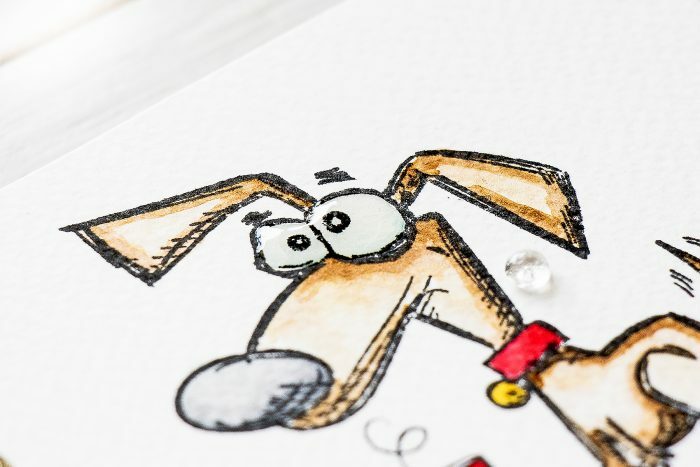 I also added a strip of gold glitter paper (to match the brown color on the dog) and adhered several clear droplets from Pretty Pink Posh. awww, thank you, Ded! its comments like yours that encourage me to think outside the box 🙂 thank you! LOL, such a cute sentiment. Another winner here Yana! TFS! Funny, I’m having my morning coffee as I’m reading your blog! I love this card and stamp set. It’s on my wish list :). haha! thank you! hope you get it! This card is so funny. I love it ! Thank’s for all your great cards. Such a great card! So clean and perfect! Love the hand drawn patterned paper!